GQ Electronics Technical Support Forum - GMC-500+ RTC HW or FW issue? 3. Why the GMC-500+ does not have its own RTC active, run from battery (or USB power)? The internal clock is always "sleeping". It is totally meaningless to synchronize the GMC-500+ clock with the host PC. Last time the Date/time was updated, was on 4 Nov on the GC. Is the sleeping GC clock a FW (1.20) or HW problem? Used Ullix's Geigerlog from the beginning over USB serial link that is why I kind of ignored the problem. Also wifi is not needed (yet), disabled from the beginning. Is wifi link always necessary? i.e. does the internal clock always depend on a NTP sync? I didn't open up the Geiger counter yet. Can you Please provide verification points on the PCB to narrow down the RTC problem? I answered your questions from the other thread. The GMC-500+ has its own RTC. Have you tried using data viewer to set the clock? or enter it manually in the settings menu? by removing the battery cover. Can you please check your hardware version if you are able to? WiFi doesn't have anything to do with the clock so it is not that issue. Don't open it yet if you're afraid of voiding the warranty. I need to check to see what we can do before proceeding. Yes, it is FW 1.20 as already reported at the start of this thread. I can only use Unix/Linux compatible software like GeigerLog since I don't own a windows PC. Geigerlog runs on an old Mac Mini with macOS High Sierra version 10.13.6 (Darwin BSD Unix) . The hardware version on the PCB is GMC 500 v3.4 20180205. See additionally below the output from GeigerLog's extended info. Wifi would only have to do something with the clock if there is a NTP client implemented that would synchronize with a NTP server like time.asia.apple.com or time.nist.gov over the Wireless LAN. My understanding from your answer is that there isn't a NTP client included in the firmware. However my mac is synchronized with a NTP server. Would make sense that GMCMAP accepts date/time stamps (and unchanged). It surprises me that it does not as you advised in my other thread under gmcmap. It is rather strange that time stamps of the time of arrival are accepted with delays possible over communication links and on the data acquisition system itself. For scientific purpose this should be reconsidered imho. We thought of it before but it would require users to have WiFi. On your device, after settings the Date and Time correctly, it becomes unsynced after a while? or after turning the unit off? It does not start. Stays at the set time. It looks like the RTC's crystal oscillator isn't working. If you can, just resolder it to see if it can be fixed. This is not going to void warranty in your case. @donghelan, did you have this issue when received the device or was it working at first? Thanks. Thanks, I gave it a try. I am not able to find it on this PCB. Maybe my eyes are too bad or x-tals are very, very tiny nowadays? Could you please provide reference pictures with explanatory text? This issue was there from the beginning. Opening the geiger counter and zoom in on the components explains very clear now why. Now I see my own picture nicely magnified in this thread I can see X1, the 8MHz unit that is ticking only for the ARM processor. X3 is empty (missing?) left from the USB2serial chip CH340C and X2 is where? Aahhh !! clearly it is missing right of the Arm processor! ****** Please contact me privately for handling this missing part asap, and also please check from the images if anything else is missing! "The DS1302 is a Real Time Clock (RTC) or TimeKeeping Chip with a build-in Trickle-Charger. 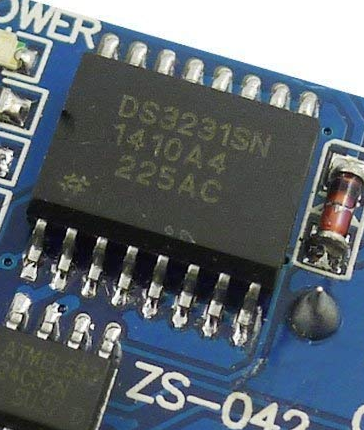 Important note : Cheap modules with the DS1302 and DS1307 have often problems with the crystal and the voltage. They often don't work very well. You are strongly advised to use a DS3231, which is very reliable and accurate and needs only a battery to run (the crystal is inside the DS3231)." I would expect something like a DS3231 chip for the RTC without external X-tal, powered by a separate Lithium battery cell so the rechargeable battery can be replaced independently. From your picture, looks like the X2 is missing (X3 is ok, not supposed to be tehre). That is for RTC. Can we ask if you are able to solder? If yes, we can send you x2 instead rather than ship back the whole device twice. Or you can buy X2 on your local store. Then we discuss how to do it. The x2 is 32768 Hz cyrstal. Thanks! Sorry for the inconvenience. Thanks, yes please send to me. Contact me privately through my forum's account for further handling please. Can you please send email to support@gqelectronicsllc.com? That's the best way. They can send you the crystal. Thanks. @donghelan or ullix - forgive my ignorance, but where is GeigerLog getting this information? Is it available in the programming of the GQ meters such that GeigerLog or other software is looking somewhere specific for it and can extract it? Just wondering. The file gcommands.py of geigerlog contains all commands. you can try yourself from a terminal program like TerraTerm, Hyperterminal, Putty or Minicom (Linux/MAC), to send commands to the serial port. The format of the return values are explained in gcommands.py as well. That could be a mix of readable ASCII and hexadecimal format binary values, also returned in ASCII format. You can see below that there is a millennium problem with the returned date format from the Geiger counter, missing 2000. In 2018, when memory/storage is much less of an issue than in previous century, programmers are still creating these problems for later . Serial port settings: Baudrate 115200, 8bits, No parity, 1 stopbit and No handshaking. 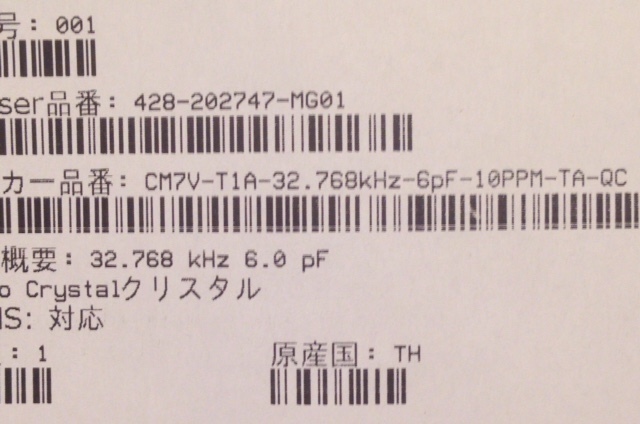 I have ordered the correct X2 X-tal of 32.768 KHz at mouser Japan for only JPY70. We shouldn't pick just any X-tal. It is very important what type you insert with the DS1302, Real Time Clock (RTC), TimeKeeping Chip, to keep the RTC ticking accurately. After it has arrived and I have inserted it successfully I will elaborate on the importance of the quality of this X-tal and the importance of how it should be soldered, located near the chip. Current location on the PCB is actually not so good. It is just a matter of reading and following up the data sheets well. I am curious about the Time deviation to UTC, QC geiger counter owners observe with their counter per month? Based on that we will know if a matching X-tal was inserted. If it is in the order of seconds then it was OK. If it is in the order of minutes then the X-tal wasn't right. @donghelan - Thanks for explaining that. I have GeigerLog installed so will try. @donghelan, thanks for ordering it yourself and trying to put it to the pcb. I hope you can make it work. If not then just send back and then we can repair it. Also you can email support for the payment of the X2 X-tal. No problem, that part can only be so bloody cheap because I had to order other stuff, eliminating transportation costs . This is an exercise in improving my soldering skills with SMD parts using two soldering irons AND taking care about limiting the Temperature rise towards the other parts on the PCB. Great! Good luck! Let us know if it works. The Geiger counter stays in sync with the PC within 0-1 secs. Despite of the fact that my soldering irons are much too big for this sub-millimeter work it takes 20 seconds to get the crystal in place. 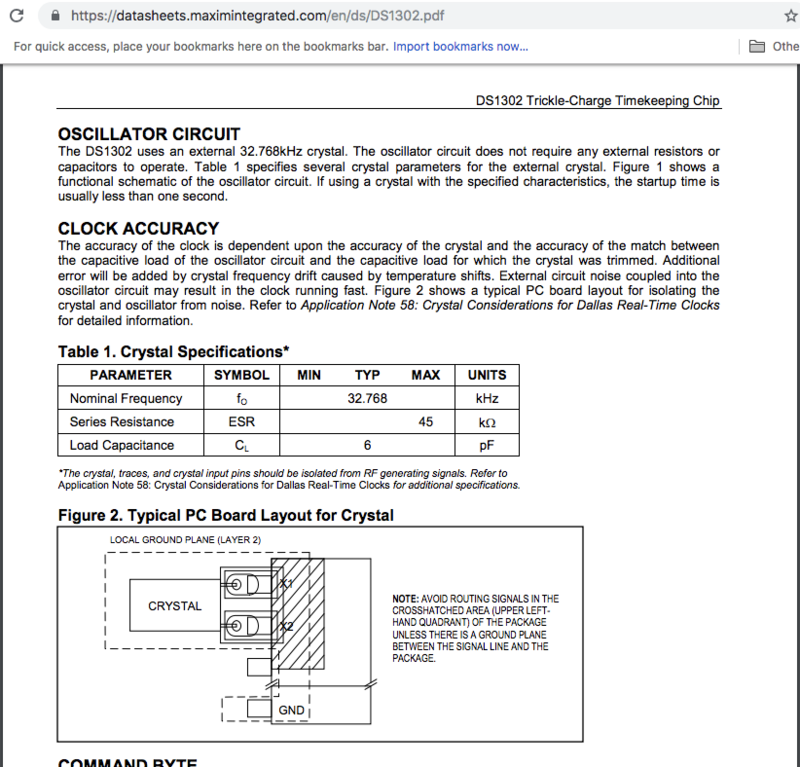 Application Note 58: Crystal Considerations for Dallas Real-Time Clocks for additional specifications. I didn't have to pass over 20 s. You know when the solder is fluid enough. Additional pictures of the crystal and work bench. After 11 hours(-2min), the RTC was 10 sec behind the PC clock. PC Clock is NTC synced towards time.asia.apple.com. Approximate room temperature: 20 C.
The GMC-500+ RTC would be almost 11 minutes per month behind real time at this rate. 1. Stray capacitance of PCB board design. The X-tal is placed relatively far away from DS1302 chip. Review PCB design to put as close as possible as recommended by Dallas Semiconductor/ Maxim. 2. Any Presence of Noise that might stop the RTC sometimes due to PCB signal routing? Confirm if any signal lines cross the X-tal lines and review multilayer PCB design accordingly. 3. Select X-tal with Load Capacitance CL less than 6pF if significant Stray Capacitance observed. [edit 2018.11.20:] This should be opposite: a X-tal designed for CL higher than 6pF. It is easy to misinterpret application notes . 4. Temperatures lower than 20 C contributes only less than 1min per month. No need for Temperature verification. [edit 2018.11.20] If I heat up the space around the counter to 25 C it would beat a little faster. Re sync at 2018-11-18 at 09.30.00. Observed time difference is 10 sec over 11 hours(-2min). X-tal best location. a smaller X-tal is available to match the available space. I guess I could sync with phone on the first of the month and we could tabulate. I take it the RTC will continue at along as there is power to the meter. So stationary or take it with you and keep it charged? My Phone and PC are always in sync. PC syncs with NTP servers. Phone might sync with GPS, Mobile Network or also NTP servers, it is usually good within 1 sec. Just keep it charged, stationary on USB or in the field and sometimes on the charger. Total deviation is minus 10 minutes and 15 seconds over 30 Days. I will start at 22:00:00 this evening. So my 500+V2 seems to have a crap crystal! Any difference in markings on the two crystals? 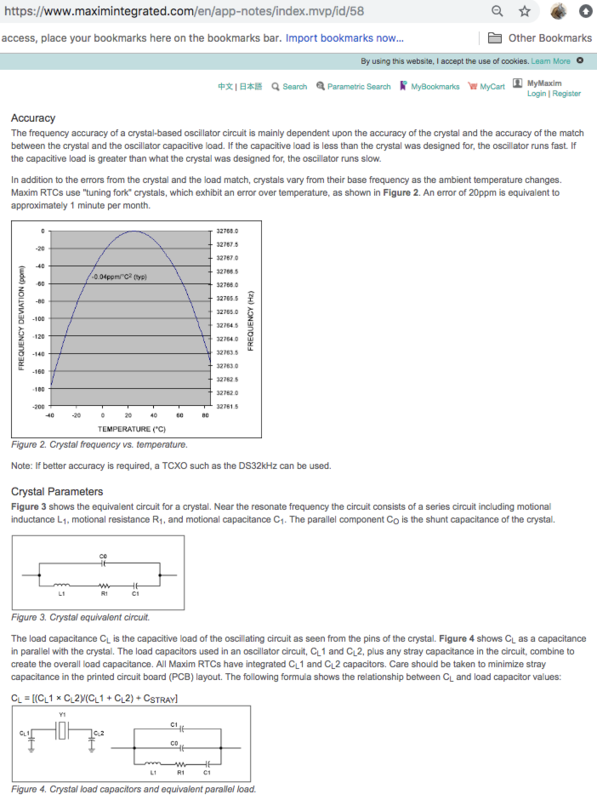 If the capacitive load is less than the crystal was designed for, the oscillator runs fast. If the capacitive load is greater than what the crystal was designed for, the oscillator runs slow. Then the V2 crystal's specified Load Capacitance could be too high, much more than 6pF. V1 is acceptable, maybe half minute per month deviation. Then it looks like my Crystal could be right because it is the necessary specified 6pF but additional stray capacitance slows the oscillator down. With a next order of components I will try crystals designed for CL of 7pF and 9pF to see if that compensates the stray capacitance in the PCB design. As I have shown in the beginning of this thread, a DS1302 RTC chip has a bad reputation in the Arduino community. Now we experience why. It is a very sensitive exercise to get it in tune. Both crystals are in identical position (at the same distance from the DS1302 chip). @donghelan, Thank you for your work and very helpful information. We will forward it to our hardware engineer. Could imply that a748n X-tal is designed for higher CL. The identification of Epson crystals is hard to grasp. What is printed on it does not match the product id. Or am I overlooking something again? You really wouldn't like to design a RTC with DS1302 chip. When you read all these different specifications it ends up a real trial and error exercise. Thank you for your hard work! They might work. Will go to Akihabara today, the "electronic paradise" of Tokyo. See if they have the same x-tals on the shelf for same low price as mouser. Sorry it took me a while to get back. from what I can see of the display, my clock doesn't seemed to have deviated at all. I have the clock sent a few month ago and since then it is plugged in to my iMac USB for power and connected to wifi. As for the measurements, yes I have noticed that my GMC-500+ shows up quite high. At the moment showing up as average of 20.29 CPM. I have another dosimeter PKC-107 and it shows about 10-12#956;Sv/h which I think is normal these days. I've adjusted the pcm to #956;Sv/h conversion factor down so that GMC also shows up about the same 10-12#956;Sv/h. Just had a look at other on the map and mine does seemed to show very high, indeed. Could it have something to do the GMC itself? Hi sannexus, CPM below 50 is normal. Readings are different from location to location so it's hard to tell whether your units is higher than others. I think yours is ok.
@sannexus this map published by the SAFECAST project is useful to check the baseline background radiation for your location. I noticed some locations in Japan have significant higher background historically. @Sannexus You are lucky with such RTC! Could you make high resolution image of the Crystal and RTC chip and publish here?. Maybe you have the right one that compensates stray capacitance in the PCB design. GQE should make a note of that and trace back what exact crystal and brand from which source. @Sannexus you should keep the conversion factor as specified by GQE for both tubes. Then you can asses better if one of them should be replaced by GQE. The 2nd tube could also be more sensitive than usual. First verify if CPM1st value is close to CPM(sum of CPM1st and CPM2nd) or not. to rule that out. Also verify the other 3 points mentioned above. Yes but it needs to be verified, he needs to maybe check in your location or other ways to see if the CPM drops to around 14. Maybe his tube is little different sensitivity(but I doubt it). Couldn't get a new X-tal yet. Maybe it is not useful at all because the RTC got faster now more than 7min. (438 sec!). Must be due to higher ambient temperature since yesterday in Yokohama and Tokyo. Meaning the RTC is very much temperature dependent. It's possible that temperature has something to do with the change. 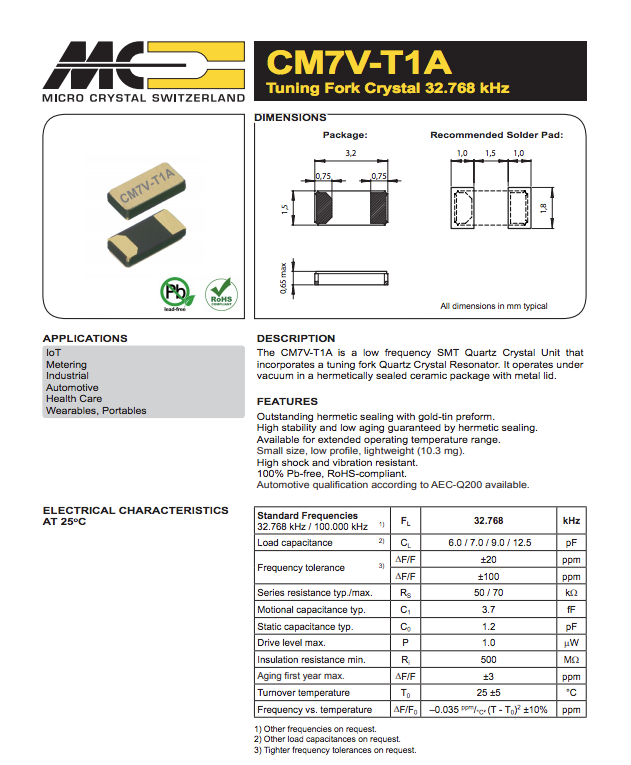 And according the our engineer, you need a crystal with 5ppm tolerance or lower to get a more accurate RTC. But don't worry about it, the local RTC is only for reference. Yeah right. the one I bought is 10ppm which is not bad. I wouldn't expect this strong fluctuation with temperature. The RTC is usually used for the base time-stamp that is why accuracy is relevant. Downside is that this chip has 16 legs. Guess I am old school without ntp syncing ability, devices need their own accurate RTC. After a few days having a much faster ticking RTC with more than 2 min per day faster, today it starts to slow down to only 80sec faster over 24hrs. Ambient Temperature about 12 degrees Celsius lower. The trend will be downwards again. As the designer of GQE advised 10ppm stability is not enough. 5ppm Chrystals are more expensive than a complete DS3231 mini board.